Investing in space is no different to investing in other industries, and now that space commerce activity has matured and expanded, there are numerous space companies to invest in. We ask investors what their expectations are, what risk they are comfortable with, and what really interests them. Concept: The continuation of the digital revolution (software, applications, analysis) and the industrial age. Technological: Hardware not only has to be efficient (e.g. energy saving, light materials), but harder (e.g. extreme temperature, radiation, depths and altitude). Space element: Global positioning and data connections, 24 hours day, 7 days a week, 365 days a year. Concept: The new ways in which to observe the earth creates more opportunities for people (including their A.I. tools) to analyse, present and forecast. Technological: As more sophisticated satellites and their data are available, skilled analysts are required to interpret and package this data for B2C, B2B, NGO, .GOV, MIL etc. Space element: Global positioning and space agency satellites are now competing with low-cost solutions like private fleets of small satellites and CubeSats. The core of SVI�s strategy is longevity; being scalable and antifragile to take advantage of every market opportunity, while remaining focussed on finding profitable space companies. The commercialization of space is a multi-generational process, and SVI is designed to survive economic cycles with capital intact, so that investor capital can be passed on from generation to generation. Profit expectations are not based on quarterly results, but are fixed to enabling our shareholders to invest in space for a profit. Space Funds that fit the SVI strategy, Space Companies and Technology Companies that have contracts for current space activities. This includes: Satellite Companies, including Low-earth orbit and Geo-synchronous orbit (vital for communications), and communications companies (but not media) that have hardware in place and are part of the infrastructure that military, emergency, maritime, communications (e.g. internet) rely on. European Space Companies, a subsidiary of SVI, focussed (but not limited to) on the emerging European space companies. Space Resources, including mining the Moon and Asteroid Mining. Space start-ups that have a commercial business model. Space related products that have a commercial application. Immediate: What opportunities exist in the next year, e.g. an upcoming I.P.O., or an imminent CrowdFunding deadline, for a commercial space related company. This also includes determining when massive market volatility, e.g. from black swan events to cyclical market bubbles, threatens to effect valuations of space and aerospace stocks, but represents a buying opportunity later on. Short Term: Based on a 1 to 5 year economic cycles (e.g. looking at the movements of the DAX and the S&P500) what are the growth prospects of genuine space stocks and aerospace companies (that have contracts for space related activities). Long Term: Anywhere from 5 to 25 years, commercial space technologies that are available to invest in, including at seed stage. Hedging: Financial products and investments that offer protection against market fluctuations, short and long-term volatility global recessions, depressions and conflict. For any realistic space investment the expectation of returns has to be adjusted to the project or product to be implemented; satellites and launch vehicles take years to develop and be active, a profitable asteroid mining venture may take a quarter of a century for a solid return on investment, and short-term commercial space projects may burn their seed capital well before they�ve turned a profit yet still offer value. Space Investing is a risky business like any other. People invest in space knowing that it is the future, and their investment will outlive them. This mentality (investing in the future) is a concurrent theme for all successful civilisations, but is sometimes lost when fast-paced and volatile markets cloud investors� sense of judgement. Many of the greatest man-made marvels of the world are here today because someone had a vision to invest and build now for tomorrow. Investing in space is no different. In the long term, companies that have the skill and technology to develop cutting edge space craft and technology. This includes companies that are not Space Pure-Play stocks, but are contributing to space infrastructure. By reading history we can detect patterns and traits of humanity; civilisation rise and fall, currencies come and go, explorations are made, humanity spreads, and innovation is a constant. To the average person, progress can be seen to be rapid in one area but slow in another. In the last twenty years the digital revolution has re-wired our social existence, yet in the last forty years no-one has kicked up dust on a planet other than our own. The topic of space, and the new philosophy of investing in space, takes consideration and evaluation. Space is an established industry (think of the hundreds of communications satellites orbiting earth that enable truly global communication) and has room to grow: space tourism, private space transport competitors, crowd funding orbiting telescopes, and numerous start-ups, that are edging higher and higher out of the earth�s atmosphere. What we see of space thanks to the mainstream media is clash of the amazing and the tragic. Every month we see new images of planets or asteroids in our Solar System, or planets detected orbiting stars. From a scientific point of view it is exhilarating. The media also entertains us with the risk of space: An exploding rocket is not only highly visual but very effective in making many of us shy from space as an asset class. Many of us live relatively safe and settled lives. Many of us have made wise investments and are fortunate to live in countries with stable political systems and a custom of supporting innovation. Now when you look at how and where you invest, you can add Space to your portfolio. Our Space Investment Philosophy is shaped by some core guidelines on how to make Space Ventures Investors an exciting company that represents shareholders and employees, and is structured to outlive them, in order to fund and profit from human endeavours in space. Your investment in Space Ventures Investors is designed to be handed down to the next generation. Investment Horizon: Go for the long-term, not just quarterly earnings focus, yet pay dividends at regular intervals. Shareholders are Voters: In the age of crowd funding and crowd sourcing, our shareholders are asked to add input on strategies and concepts that will drive the business. Be a Survivor: Cyclical volatility, including stock market crashes, recessions, currency debasement, and conflict, are matched by black swans that offer opportunity. Our goal is to be aware of what goes on a global-macro and space-micro level and hedge accordingly � be anti-fragile. 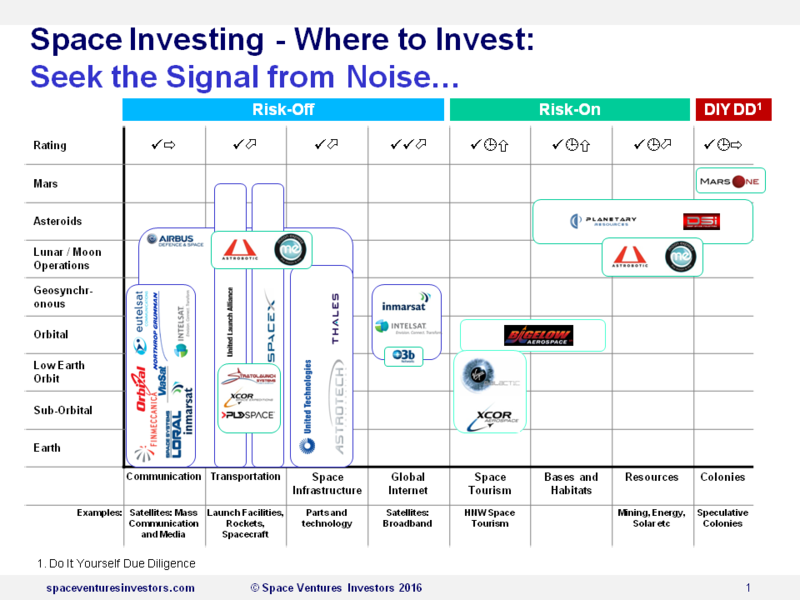 Portfolio Management: Investing in space includes aerospace, private space companies, specific space start-ups, and ventures that haven�t been started yet. Spread the Risk: Preservers of wealth have certain rules that have been handed down through the ages. Some of these are built into our investment philosophy. Our goal is not to deliver staggering profits in the shortest period of time, our goal is to wisely invest shareholder capital in space, make a profit, pay dividends, and outlive the market. The concentration of investments on risk-prone assets is the greatest threat to any venture. Invest in the Future: While there are currently enough space related equities to build a profitable portfolio, and risk and opportunity can be hedged on new space companies, our goal is to invest in the future of humanity by looking for profit in the space industry. This is an ongoing theme and for each investment the question has to be asked: Where will this be in one, five, twenty or a hundred years?